“Organising an event is a big job, no matter which way you slice it”, says Emily who nonetheless, managed to do a mighty fine job orchestrating her own lunchtime wedding, held on a private property located over an hour north of Brisbane. 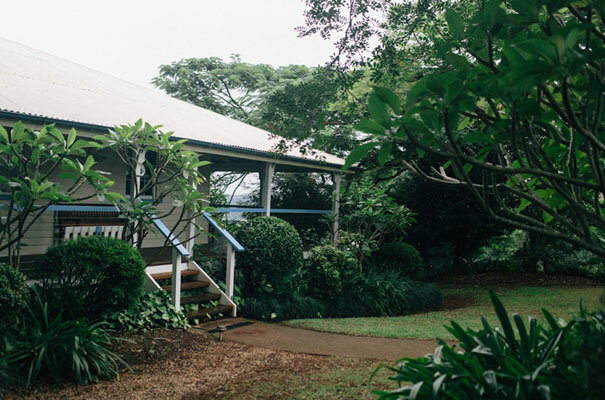 “The property at Woombye goes back a few generations on Lachlan’s side and it holds a special place his heart”, adds Emily who knew almost every vendor personally, including their talented photographer Jazzy Connors. Having so many creative friends and family on board – including Emily’s grandmother who folded 1000 origami cranes for their invitations (yes, 1000!) – made the whole event much more meaningful with some guests contributing desserts in lieu of a wedding cake. Keen to scope out another backyard shindig? Why not check out Molly and Sam’s beautiful backyard wedding captured by Luke Going Photography and A&Y Videography. Her BHLDN top and skirt is also killer! CREDITS Photos Jazzy Connors Photographer // Bridal gown Catherine Deane via BHLDN // Shoes Jo Mercer and Wittner // Bridesmaid dresses Jacqui E // Groom and groomsmen suits M.J. Bale // Tie Anthony Squires // Grooms shoes Zu // Socks Roger David // Flowers Petal and Stem // Paper Keredo via Etsy // Ceremony and reception private property, QLD // Catering Connections Catering // Prop hire Mooloolaba Party Hire // Rings Argyle Jewellers and Stout Woodworks via Etsy.